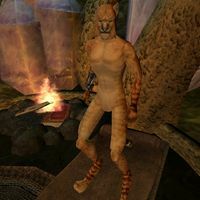 Ra'Zahr is a Khajiit slave in the possession of Mistress Therana who can be found standing in Therana's quarters. Ra'Zahr wears nothing except for his slave's right bracer. Like all Khajiit, he can see well in the dark and can demoralize others for short periods, but otherwise he knows no spells. "You want me to wear that skirt?" Nevermind. "Ra'Zahr does whatever %PCName says." "The Mistress is right there." New Clothes: Deliver a skirt to Mistress Therana in Tel Branora. This page was last modified on 23 October 2018, at 19:46.